Lucien Grimaldi comes from the more factually murky period of the Lords of Monaco and his reign starts out with rumors and accusations rather than hard facts. The rumor is that he obtained the lordship of Monaco by stabbing his older brother, Lord Jean II, to death after a quarrel over the suggestion of selling Monaco to the Venetians. It was October 11, 1505 at the Grimaldi castle in Mentone where Lucien, Lord Jean II of Monaco and their mother were having dinner at which time the alleged confrontation is to have taken place. However, there is plenty of evidence that this did not happen including the fact that the boys mother, Claudine, who was very attached to Jean II never seemed to bear any grudge against Lucien which certainly would have been the case had he been guilty of the crime of which he is accused. In any case, however Lucien came to be the Lord of Monaco, no one can doubt his courage and commitment to his country as it was only the following year that the Republic of Genoa launched a major effort to retake Monaco and laid siege to the country for 102 days with a force of 14,000 men. What is ironic about this attack is that Genoa itself had only recently been freed itself from French rule and many Genoese had fled to the protection of Monaco. During this time Lucien was ever present in defending his country alongside his brother Charles Grimaldi and Bartholomew Doria. For the first time in Monegasque history canon fire blasted the castle walls. A last attack was made on March 19, 1507 at Serravalle where the old tower stands guard today behind the palace overlooking the Nice road. A breach had been opened in the wall there but the Monegasque worked feverishly to construct new barricades and when the Genoese attacked they fought heroically to throw back the invaders with Lord Lucien leading them. The Genoese were so distraught by their failure and the seemingly unshakable tenacity of the Monegasque that they thereafter called off their siege and sailed back to Genoa. Lord Lucien was the man of the hour and the world of the Mediterranean was greatly impressed by his heroic leadership in the defense of Monaco. It had been a desperate fight though and King Louis XII of France suddenly worried that if a future attack ended differently it could be a threat to French security. As a result the King of France made it his mission to ensure that Monaco would be a French ally no matter what he had to do in order to get Monaco on side and keep them there. The famous (or infamous) Italian writer Machiavelli was forced to pay attention to these events and in 1511 he visited Monaco as a representative of Florence and their maritime interests. In Spain, King Ferdinand the Catholic heaped praise on Lord Lucien for his defense of Monaco and in 1512 a new assertion of Monegasque independence was made and Lord Lucien began to mint his own currency, featuring his own profile. Nonetheless, it was clear that Spain and France were developing a rivalry over who would be the guardian big brother to little Monaco. Lord Lucien enlarged the territory of Monaco in 1515 when he bought the feudal rights to Menton from the Countess of Villars. The city would remain under Grimaldi rule until the reign of HSH Prince Charles III when Menton and neighboring Roquebrune seceded from Monaco in 1848. Despite the diplomatic tightrope that Lord Lucien had to walk it would have seemed from the outside that Monaco and the Grimaldi family were at the top of their game as 1520 passed. They had impressed everyone with their victory over Genoa, maintained their independence and were being courted by the powerful kings of France and Spain as well as business interests from Florence and other Italian city-states. In 1522 Monaco was even honored with a visit from Pope Hadrian VI. However, as is often the case, the success of the reign of Lord Lucien won him as many enemies as admirers and the most jealous of all was the powerful Doria family of the Republic of Genoa. The Dorias were actually relatives of the Grimaldis and Bartholomew Doria had helped Lord Lucien defend Monaco during the Genoese attack. Bartholomew was a nephew of Lucien as his mother, Francoise Doria, was the sister of the Lord of Monaco. 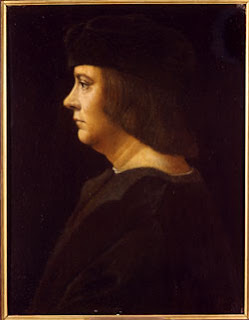 However, he later began to conspire to overthrow Lucien, allegedly with the knowledge and support of the famous Admiral and restorer of the Genoese republic Andrea Doria. As usual, Monaco was the sight of a real-life drama that could put the most gifted novelist or soap opera writer to shame. Bartholomew came to visit Lucien on August 22, 1528 though, suspiciously, he became nervous and agitated when Lucien invited Bartholomew to accompany him to mass. His nephew, perhaps not wishing to confront the Almighty at such a time, refused to go along. Later that evening, after having dinner together, Bartholomew lured Lucien to an empty part of the palace where his conspirators were waiting. When Bartholomew and Lucien appeared these men sprang from the shadows and assassinated the Lord of Monaco before quickly moving to secure the lower levels of the palace. Their plan was seize the palace and then signal a naval force waiting in the Port of Hercules under Andrea Doria which had been sent to help conquer Monaco. However, things quickly went wrong for the conspirators. The palace personnel upstairs fought back and prevented them from obtaining access to the higher levels and when Bartholomew and his men dragged the body of Lord Lucien outside, down the palace steps to prove his death to the public the populace was enraged rather than cowed. The Monegasque were then rallied by Augustin Grimaldi, Bishop of Grasse (brother of Lucien) who had just arrived from Cannes and the people began to fight back. Desperate, the conspirators then took Lucien’s wife, Jeanne de Pontevis, and their children hostage at knife-point and threatened to kill them all if they were not allowed to safely escape. With no other choice the Monegasque allowed the murders to get away and the family was not harmed. Lucien was immediately succeeded as Lord of Monaco by his baby son Honore I who was acted for by his uncle Bishop Augustin Grimaldi. He would pursue the killers of his brother by breaking from France and joining Monaco in an alliance with Spain and the Holy Roman Emperor Charles V. So it was that the Lord of Monaco who had been accused of attaining that position through the assassination of his brother ended his reign by himself being assassinated by his own nephew. Way more information than wiki even began to leak. Honore I is my 1st cousin! But how many times removed?